Transparency Market Research observes that the new entrants have been hesitant to enter the global nanosilver market due to its capital-intensive nature. Owing to this, only a few companies hold a leading share in the overall market, making the competitive landscape moderately consolidated. The research report identifies Bayer MaterialScience, Nano Silver Manufacturing Sdn Bhd, and Applied Nanotech Holdings, Inc. as some of the leading players in the overall market. Majority of the players operating in the global nanosilver market are focused toward making strategic alliances to gain a competitive advantage. In the coming years, companies are also expected to focus on expanding their operations to untapped parts of the overall market. According to the research report, the global nanosilver market was valued at US$682.0 mn in 2013 and is expected to reach US$1.8 bn by the end of 2020. During the forecast period of 2014 and 2020, the global market for nanosilver market is expected to register a robust CAGR of 15.4%. The electrical and electronics segment is expected to offer several lucrative opportunities to the overall uptake of nanosilver as the trend of miniaturization continues to strengthen. 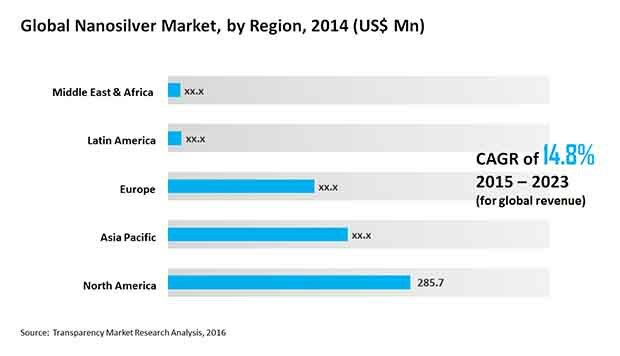 Regionally, North America is expected to lead the global market for nanosilver as it promises to register a CAGR of 12.9% between 2014 and 2020. Researchers attribute soaring profits of nanosilver market to the metal’s superior electrical conductivity. This very property has won nanosilver extensive usage in the electrical and electronics industry. Thus is the growing demand for consumer electronics is expected to have a positive influence on the global nanosilver market. Nanosilver is used as an alternative to carbon nanotubes, graphene, traditional silver, and indium tin oxide. The flourishing electronics and electrical industry, which is marked by increasing sales of smartphones and household devices is projected to be the key contributor to the overall market in the coming years. Nanosilver finds incredible usage in miniaturization of printed sensors, printed circuit boards, and capacitors. Additionally, excellent antimicrobial properties of nanosilver has led to its growing application in the pharmaceutical industry. The changing medical and healthcare sector are also expected to propel the growth of the global nanosilver market. Today, nanosilver is extensively used for the production of bandages, surgical blades, and for wound dressing. Analysts expect that nanosilver market will also have high hopes of employment from the food and beverages industry and textile industry. Growing expenditure on healthcare, especially in the developing parts of the world, is expected to key a role in augmenting the demand for nanosilver in the coming years. On the downside, the global market for nanosilver has its own set of challenges. The biggest challenge for the global market is the exorbitant cost of production as compared to conventional silver. This translates to significant capital investments, which is not possible for most players. Thus, it has restricted the entry of several players. Capital-intensive nature of the market has also magnified the risks of breaking even and surviving competition for many companies. Furthermore, the volatile nature of raw material prices is projected to hamper the growth of the overall nanosilver market in the forthcoming years.